Earlier this month, Dr. Feeney announced that Mr. Bronston Sterner had been selected as the inaugural Teacher of the Month for January 2017. It is now time to select the February Teacher of the Month. 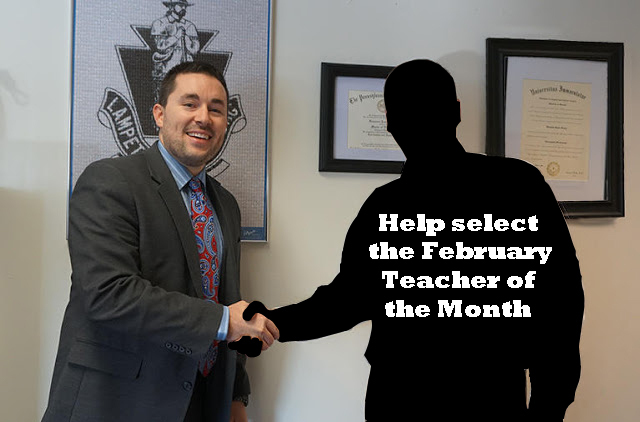 Help select the February Teacher of the Month. In an attempt to recognize the outstanding efforts of the most involved, supportive, and innovative educational professionals, the Teacher of the Month committee is currently seeking nominations for February. Any member of the L-S community are permitted to nominate a faculty member for teacher of the month. Nominations can be made online by clicking this link. The teacher's participation evidences a pattern or propensity to go above and beyond the defined duties and responsibilities associated with his/her position. The teacher has developed and implemented a creative or innovative instructional strategy or approach utilizing technology, presented it to colleagues during the "tech tips" portion of a monthly faculty meeting during the school year, and added it to the High School Schoology/Google Docs site to allow faculty access and use, OR has developed and implemented a creative or innovative instructional strategy or approach utilizing technology that he/she uses in the classroom to improve student learning. The teacher demonstrates punctuality and professionalism at all times. The teacher participates in a leadership, advisory, or coaching role in at least one school sponsored extra-curricular or co-curricular club, athletic team or department OR regularly supports students through attendance at athletic, extracurricular, or co-curricular events, activities, or contests. The teacher effectively and professionally communicates with all stakeholders including, but not limited to, students, parents, teachers, staff, administrators, and community members in a timely fashion. Nominate your favorite hard working and dedicated teacher by clicking this link.